Home PAGASA PAGASA Weather Update for New LPA as of 4:00 AM 09 October 2018. 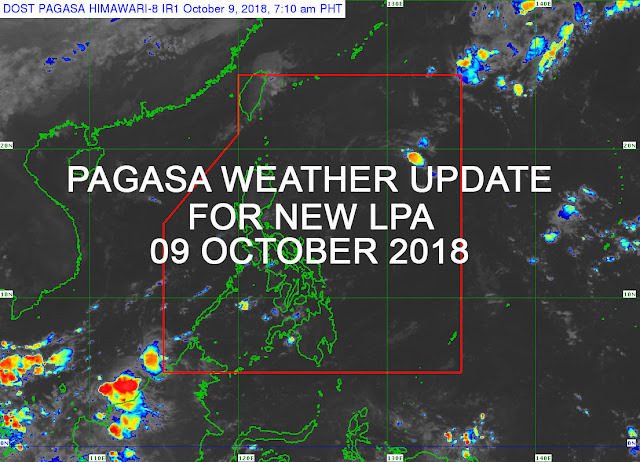 PAGASA Weather Update for New LPA as of 4:00 AM 09 October 2018. Synopsis: At 3:00 AM today, the Low Pressure Area (LPA) was estimated based on all available data at 970 km East of Aparri, Cagayan (18.6 N, 130.8 E). Easterlies affecting the eastern sections of Visayas and Mindanao. National Capital Region - Metro Manila and the rest of NCR-PRSD forecast areas will experience partly cloudy to cloudy skies with isolated rainshowers or thunderstorms. Light to moderate winds coming from northeast to east will prevail, while becoming west to northwest over Zambales and Bataan. Southern Luzon - Bahagyang mapanguron sundo sa mapanganuron na kalangitan na may pulu-pulong mga pag-uran o pagkikilat-pagdaguldol ang iiral sa Rehiyong Bikol, Oriental Mindoro, Romblon, Marinduque, asin Norteng Samar. Maluya sundo moderato na duros na haling norte-sirangan ang iiral, na may banayad sundo sa moderato na pag-ukol ning kadagatan.